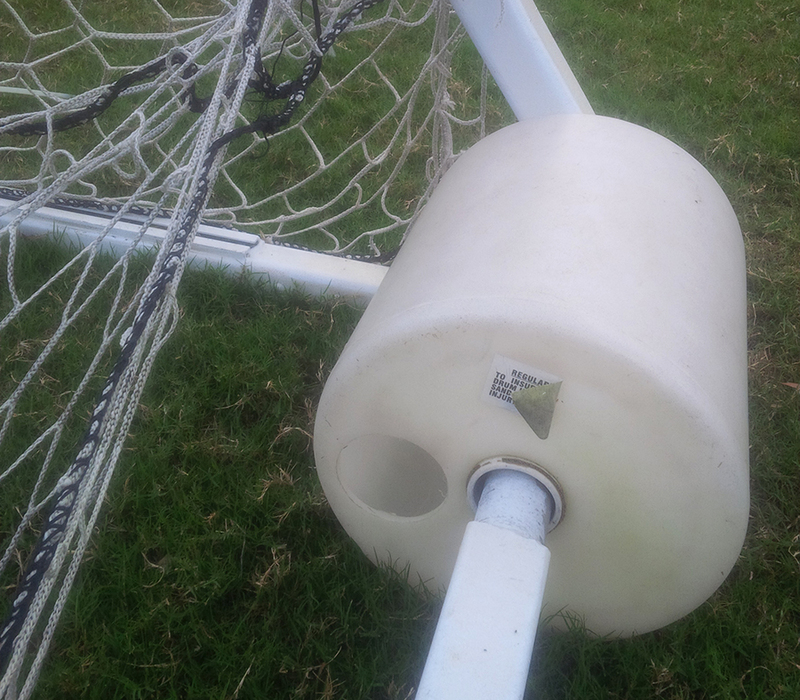 Staff member of SafeSoccer Goals received a US Patent #5,273,292 for a Collapsible Soccer Goal… Patent was assigned to Jaypro LLC of Waterford, CT. The goal can be collapsed and locked each day but it is not easy to move. The CPSC released ineffective safety recommendations that only apply during games. SafeSoccer Goals received approval for US Patent #8,579,736 that includes rear bar rollers that provide safety and portability. We were proud of this design but there are flaws that hinder its effectiveness. Roller plugs routinely pop off, sand falls out of rollers, and nets constantly catch under the rollers and make the goals impossible to move. We sold the patent to Bison in 2017. 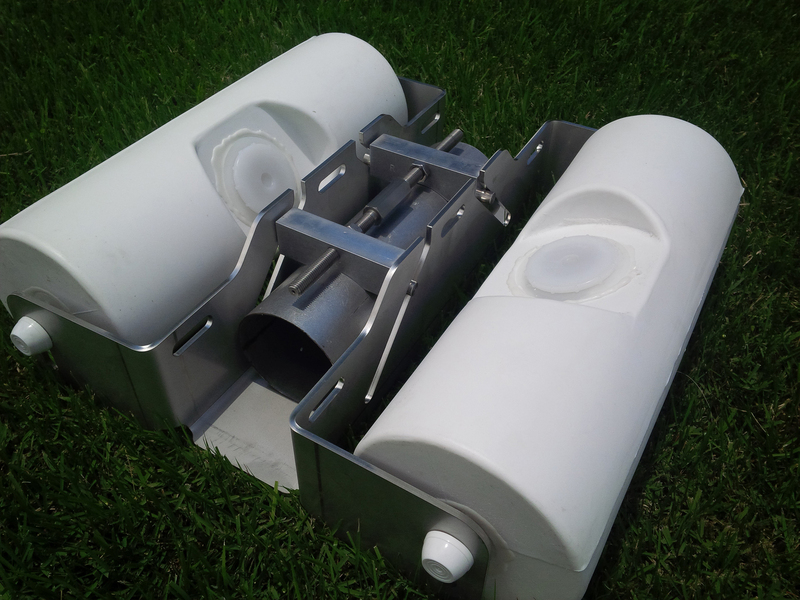 Recognizing the need for a ballast system that could be attached to the rear bar of any existing goal on the market and offer total safety and portability, SafeSoccer Goals applied for a US Patent for a double roller design. SafeSoccer Goals received US patent #10,010,776 for a soccer goal safety device. 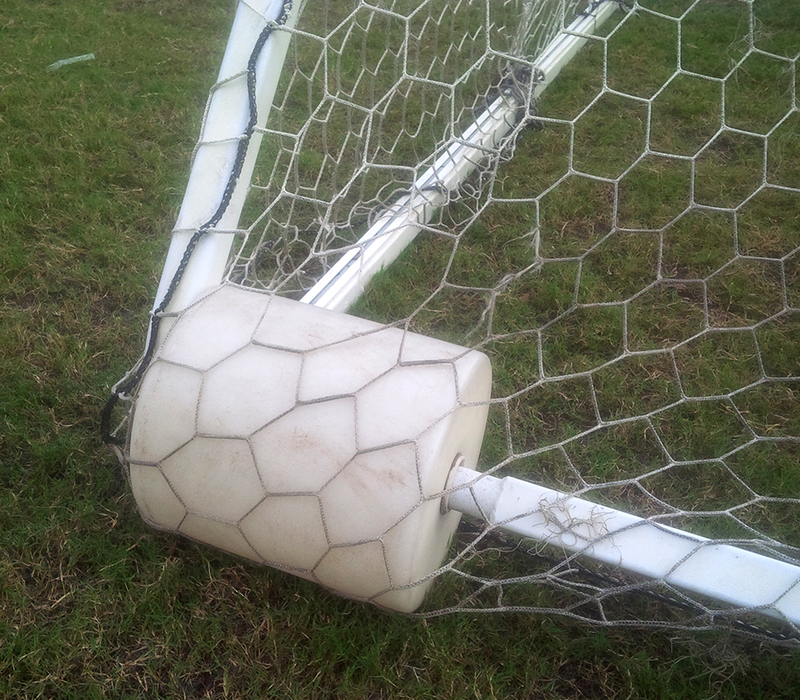 SafeSoccer Goals has experienced more than 28 years of innovation focused on making portable soccer goals and we have failed. Since 1990, thirty more kids have been killed by accidental soccer goal tip-overs. We sincerely hope that our SSG-14R retro fit kit and our innovative soccer goal designs will finally “make a difference”. To be a different kind of soccer goal company we must act differently. We focus our resources on quality and design so we must contain our costs elsewhere. We won’t have an expensive warehouse full of multi-colored nets, cones, or dummies because we don’t know anything about the game of soccer. We won’t shell out your money for expensive sponsorships. We will only sell direct to clubs, schools, and colleges – so we don’t have to add the 25%-30% to sell via soccer web sites, dealers, or catalogs. We don’t want to be just another picture on their sites! 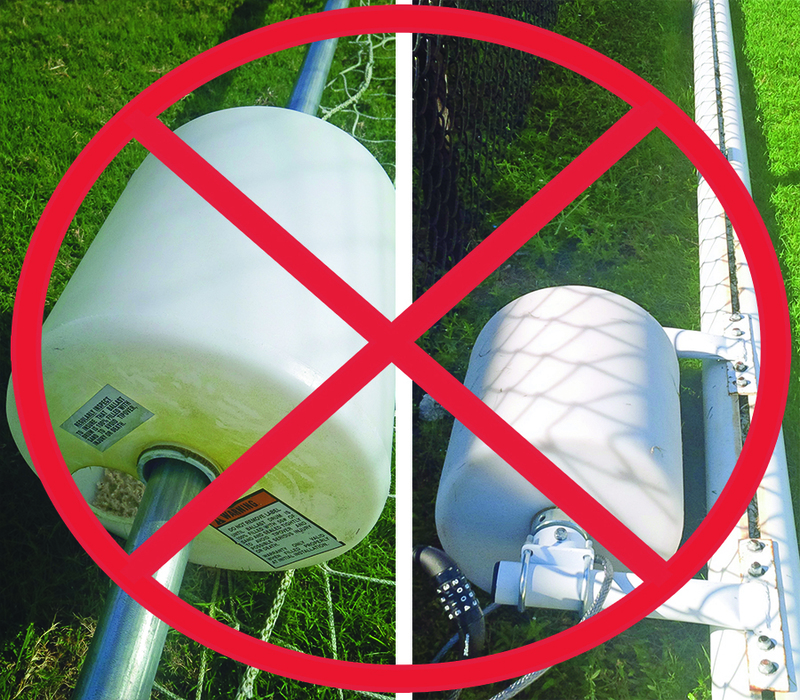 We also won’t have an inventory of every soccer goal size and configuration on the market. We want to provide our customers with the perfect product – so it will be via special order ONLY with 6-8 weeks lead time. There are dozens of small goals out there so we will only offer sizes 24′ x 8′, 21′ x 7′, and 18′ x 6′. Each goal will include 3 rear roller assemblies welded to the rear bar and a heavy duty “no tilt” flip wheel welded to the front of the goal which will make each goal safe and portable 24/7. 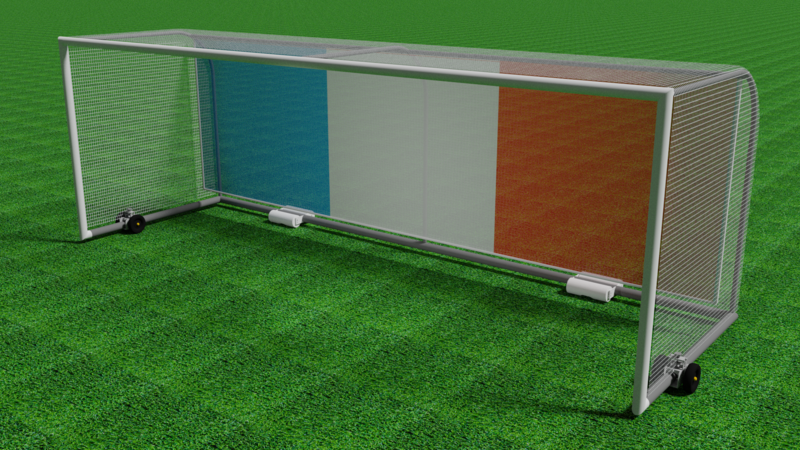 Another unique feature of our patented design is to offer custom-made goals that will fit under a football goal post that is only set back 5′-6′ from the end line – which is frequently the case in schools where the fields are shared with the football team. 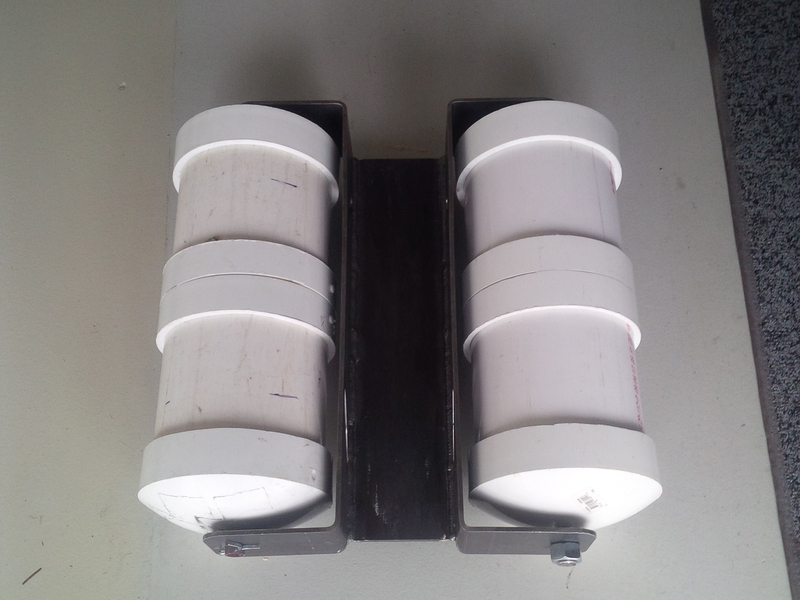 The roller assemblies, when filled with sand – about 120 lbs of ballast – offers total safety from accidental tip-overs. The 240 lbs requirement you sometimes hear about in the industry is a European standard that mystifies our engineers just like the European backstays which add weight in the wrong place. In fact, no more need for those Euro backstays that let the net droop on to the goalies’ heads. We have added a unique center backdrop that will square off the net without having to add more posts or giant bows. However, we don’t want those blistering kicks hitting the center back drop so we have added our most exciting innovation: our red/white/blue “baffle net”. This ingenious net will hang forward off the center back drop and catch most of the kicks on the goal. If this hand-made net ever wears out, you can replace it for a fraction of the cost of a full net. For orders or questions about SafeSoccer Goals‘ innovations or products, call now!